Schwinn® is an American icon and a leading brand of bicycles, recreation products and fitness equipment. Schwinn® is at the forefront of fitness technology advances and has been a vital player in revolutionizing cycling and fitness around the world. Bring better health into your life by bringing Schwinn® fitness into your home. Offering high-quality engineering, essential features and an effective full-body aerobic workout, the Schwinn® 430i Elliptical Cross Trainer is the perfect machine for home. Enjoy low impact training at an affordable price, without compromising your results. 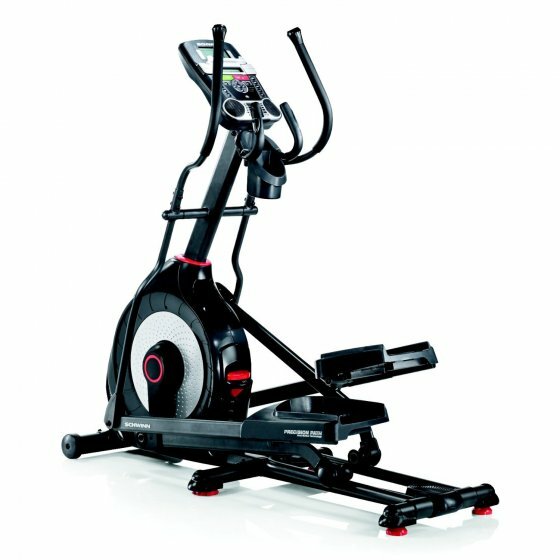 Introducing the upgraded Schwinn® 430i Elliptical with an updated user interface featuring a unique DualTrack™ multi-LCD display and workout tracking capability to help the user achieve their fitness goals. Elliptical trainers are known for effective, full-body workouts. The Schwinn® brand is known for excellent quality and value. The 430i puts the two together to bring you a smooth, comfortable workout experience that increases cardio and muscle strength while shedding unwanted pounds. And with its sleek, streamlined console, the Schwinn 430i makes it easy to track your data and monitor your impressive results. This revolutionary elliptical also includes a 10-degree manual ramp to add an extra level of intensity to your workouts, this added feature enables you to get your heart rate up faster and therefore burn more calories in comparison to walking/running on a flat surface. Feedback: Time / RPM / Distance / Pulse / Speed / Calories / Resistance Level / Course Profile / Heart Rate Zone Indicator / % Complete Indicator / Intensity Meter / User Indicator / Goal Achievement. Resistance: 20 levels of eddy current brake resistance aligned with a high speed, high inertia perimeter weighted flywheel for a smooth and quiet workout. Stride Length: 20" Precision Path™ Stride helps exercise each muscle group completely. Ergonomically Placed Handlebars: With both moving and static handlebars you can get both a great full/upper body work out in or take it easy and just hold on.